Tell me something I don't know about this track? The Meadowlands' popular nickname is "The Big M."
Hambletonian on August 5, 1989. Park Avenue Joe, ridden by Ron Waples, and Probe, with Bill Fahy, each had won a heat when they met in the two-horse race off. 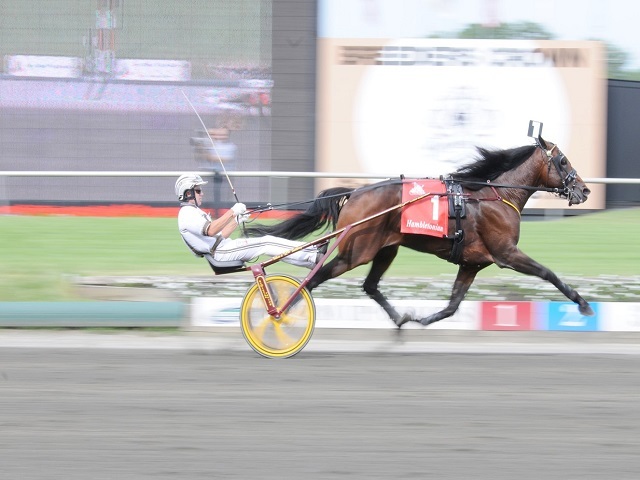 The photo finish revealed the first and only dead heat in Hambletonian history. Any tips on how to find winners at Meadowlands? The most significant aspect of picking a winner here is envisioning the trip your horse will have as well as being able to recognise a previous bad trip from a most recent start. Many horses fall victim to the "Meadowlands shuffle". The old fashioned term describes a horse and jockey (or 'driver' in US parlance) who elect to sit in third or fourth along the rail (without pulling out) and get shuffled out of contention when the rest of the field moves simultaneously outside of him during a favourable race flow. A 15% win rate constitutes an excellent overall strike rate. The "Universal Driver Rating," is a number calculated like a baseball batting average. Any number over .300 is considered excellent. Choose a jockey whose average is .300 and/or wins at a 15% or greater rate. It is important to read the conditions of each race to help determine how each entrant fits. Entrants that narrowly slide under a particular class money requirement (i.e. "Non-winners of" or "lifetime winner of" a specified $$$ amount attached) are always worth special attention and consideration. Frequently, you'll see a horse that has been stuck in the outside posts for several consecutive races. When the horse finally draws inside, the connections are usually going "all out" to take full advantage of the favourable draw. The one-mile Meadowlands track is a two-turn track, and is therefore less biased because of the longer straights. Early speed is always important. The bias is not as strong on one-mile tracks such as the Meadowlands, but it's still an essential criteria for picking winners. The last quarter mile is an important handicapping angle at the Meadowlands. A horse that can pace or trot a sub 27-second final quarter mile is always dangerous. When betting at Meadowlands Harness look out for..
Horses who've dropped in class; have a key jockey or trainer change or get an improved post position.